Nearly perfect weather allowed for some great racing to go down at the Lavergne-Gibson course, on Sunday for the 2018 Nike Cross Midwest Regional Meet. There was some uncertainty coming into the meet since Ohio hosted their state meet just a day before and many teams and individuals were either not coming anymore or would not be able to race to their full potential. But don't worry the competition was still fierce as ever. First up were the undercard races starting with the frosh/soph races. Both the boys and girls races looked pretty similar to each other, with a small little group of three or four together. 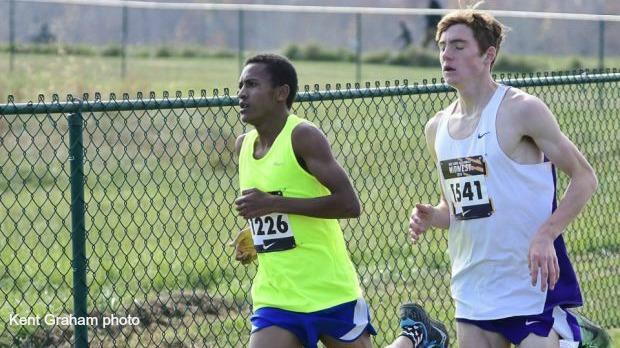 But in the boy's race, we saw freshman Izaiah Steury from Angola High School break away from the rest of the pack in the last 400 meters or so, to take home his first major high school win in 16:26.2. Alpena, MI sophomore Drew Seabase took 2nd in 16:32.3. After the frosh/soph races, you could sense the energy level beginning to build as the first of three open races got going with Open 1 for the boys. This one was dominated by Indiana athletes, with three in the top five. Junior Jack Kovach from Indy Brebeuf Jesuit walked away with the win in 16:20.5. Right behind him was another Indiana athlete, senior Grant Wilson, aka the intern, of Hamilton Southeastern finishing just one second behind in 16:21. The open race has gotten so large in the Midwest that there are now two races, which are combined for awards and team scoring, so there was still one more race to go to determine the real winner here. Race two was dominated by Illinois runners who put three in the top five. The kid who walked away with the official open race win hails from Monticello HS in Illinois, senior Garrett Dixon. He crossed the line in 16:00.6, a whole 6 seconds ahead of 2nd, Fiker Rosen from Quincy IL. Olio Road Track Club, aka Hamilton Southeastern, put together the best team they could, scoring 113pts to win the team title. The girls may not have two open races, but that didn't mean it wasn't as highly competitive as the boys. The lead group went through the first mile just around 5:25 or so, with a pack of about 5 girls at that time. A group of three started to breakaway not long after that, with Shelbyville IL junior Ailey Mitchell, Oswego East IL freshman Madison Zarembski and Lulu Black going with each other and challenging the pace. These three went back and forth for a good K and a half with who was controlling the lead. In the end, Black, of Hamilton Southeastern, felt good to go and took home the win in 19:06.3. She told us afterward that was just using this race as a hard workout before racing at the Mideast Meet next weekend. Zarembski took 2nd in 19:12.5. The No Mas Running Club, aka Mason HS from OH, put together a stellar race after taking 4th in their state meet on Saturday to win the open race here with 70pts and 4 of their 5 runners in the top 15.